Kyle Rudeiger gets fouled and completes the three point play after Seth Schenck made a nice feed inside, giving New Haven a 3-0 lead. New Haven, Mo. 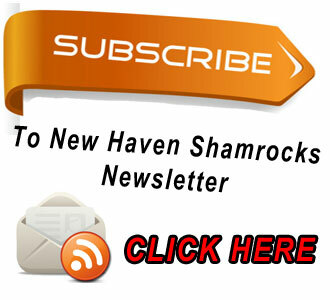 - Monday night New Haven picked up their first postseason win in two years as the Shamrocks had three players post double figures for the sixth time on the year. Kyle Ruediger led New Haven's balanced scoring attack with a game high 17 points with Alex Poggas adding 11 points and Brandon Carey contributing 10 points as the Shamrocks knocked off #7St. Vincent 54-41. New Haven jumped out to seven point lead early in the second quarter, 17-10. St. Vincent would go on an 8-2 run and pull within one, 19-18. Seth Schenck answered with a 15-footer as time expired to end the half and give New Haven a five point halftime lead 23-18. 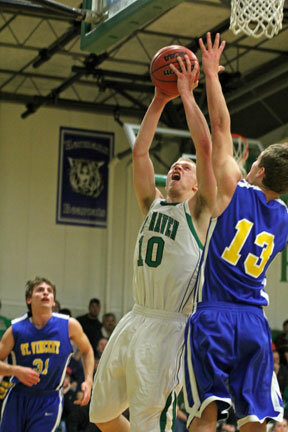 New Haven senior point guard Seth Schenck scored a game high 16 points Friday night. Schenck had struggled early in the year shooting the ball but has come on strong, scoring in double figures in his last five games, averaging 14 PPG (season average is 10), while shooting 52% from the field and 75% from the line. Owensville, Mo. - New Haven is riding into tonight’s first round of Districts after ending the regular season with back-to-back wins. 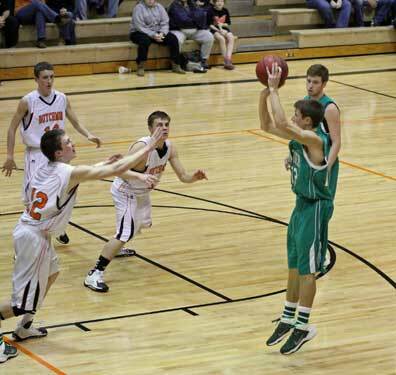 Thursday night the Shamrocks easily beat Wellsville 56-34 before sneaking away with a 35-30 win the following night at Owensville as New Haven ends the regular season 17-8. Seth Schenck off a steal gets fouled and completes the three point play in the first quarter in Tuesday night's loss to St. Clair. Schenck scored a team high 19 points of 7-12 shooting, knocking down three jumpers from behind the arc. Last night Kyle Ruediger scored a game high 23 points and Seth Schenck added 11 points, seven assists, and three steals as New Haven ended their four game skid with a 56-34 win over Wellsville. 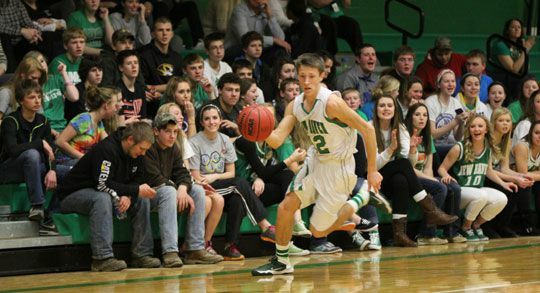 Tonight New Haven will play their final regular season game at Owensville, hoping to build some momentum before Monday’s first round in districts. --Note about Class 2 District 4 admission as set forth by MSHSAA. Admission to District Basketball Tournament games will be $4.00 for everyone ages 6 and up. Only those listed on a school's pass list will be admitted free. This means that no employee passes from other schools can be accepted and no Senior Citizen discounts. New Haven, Mo. - It should be an exciting week of postseason basketball at New Haven as they will host the Class 2 District 4 tournament for the first time since 2010. 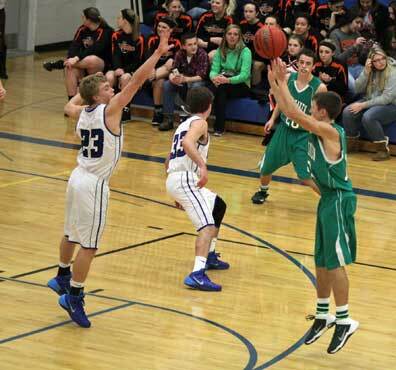 Seth Schenck drains one of his two three pointers in Saturday's third place game against Hermann. --New Haven grabbed two big wins this weekend in less than a 24 hour stretch after going six days without playing thanks to the winter weather. Friday night New Haven picked up their first conference win on the road defeating Union 52-49 in double overtime then turned right around on Saturday to beat Hermann in the third place game of the Hermann Tournament in another tight game 56-51. Kyle Ruediger and Seth Schenck led New Haven in scoring with Ruediger scoring 20 points Friday night followed by a repeat performance against Hermann with a game high 24 points. Schenck was perfect from inside the arc against Union (4-4) as he put up a season high 18 points and then scored 16 on Hermann. Ross Seitter gets elbowed, sending him to the ground and a flagrant foul being called. Union, Mo. - Last night's Four Rivers Conference JV & V games combined for a total of six overtimes at Union High School. In the JV game New Haven trailed by four in the 4th overtime when Andrew Menke drained a three and was fouled with 1.8 seconds remaining to pull New Haven within one. Menke's free throw was off the mark as Union held on 37-36. In the Varsity game New Haven's Ross Seitter took a beating, getting elbowed not once but twice. The second elbow sent Seitter to the ground as the foul was ruled flagrant and Union's Nick Ziegler ejected.